Originating in the Mediterranean region of Europe, parsley has been consumed for at least 5,000 years. It was introduced in America by the first European colonists and quickly spread far and wide. 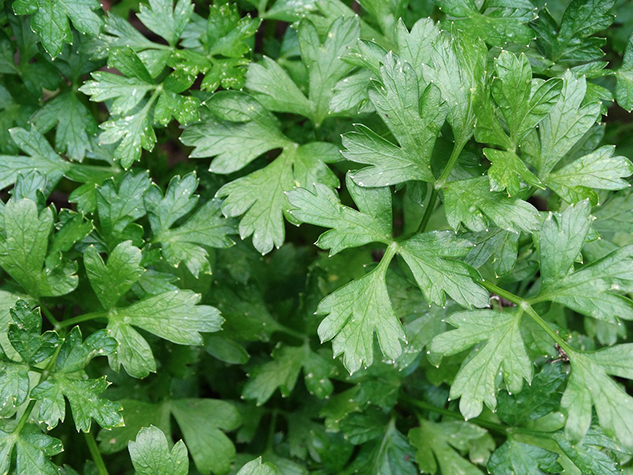 Curly leaf parsley is mostly used as a garnish in dishes, while flat leaf parsley (also known as ‘Italian’ parsley) is preferred for its flavour, as it is tastier, has more bite and is also richer in essential oils. Some varieties of parsley have a large root that is also appreciated for its taste, but its consumption is mostly limited to Central and Western Europe. Parsley is a biennial plant, which means that it is only during its second year in summer, that its yellow flowers release oval, brown and striped seeds. That’s why parsley is supposed to try the patience of any gardener. From a nutritional point of view, parsley is appealing as much for its vitamins and minerals as for its antioxidant potential. The latter is especially due to the fact that parsley, more than any other aromatic herb, is used in greater abundance in salads such as, for example, the classic Tabbouleh. Originally published in the Journal de Montréal on June 11, 2010.